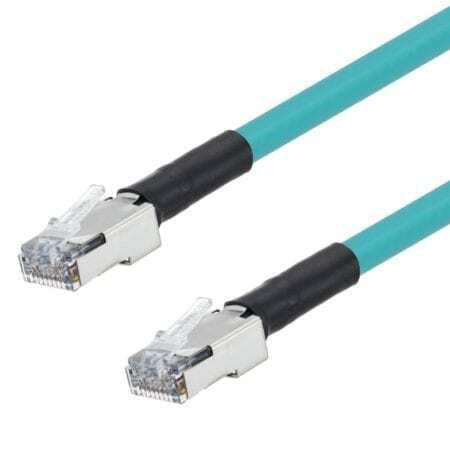 L-com, a preferred manufacturer of wired and wireless connectivity products, announced today that it has launched a new series of double-shielded, Cat5e, outdoor, high-flex, PoE, industrial Ethernet cables that are ideal for PoE 802.3af or 802.3at, industrial, automation, manufacturing and outdoor use applications. L-com’s new line of Cat5e, high-flex, PoE, industrial Ethernet cables consists of 20 models that are made with an outdoor-rated, flame-retardant thermoplastic elastomer (FR-TPE) jacket that is resistant to oil, UV, cut and weld-splatter while maintaining a UL-CMX flame rating. These cables have a flex rating of 1 million cycles at 3.01” and 10 million cycles at 6.02” without performance loss. They also feature a foil + braid shield (SF/UTP) along with fully shielded RJ45 connectors that reduce and eliminate EMI/RFI interference. These unique 24 AWG stranded 600V cables can be run with power cables without the concern of voltage jumps. “These new ultra-flexible, Cat5e cables are designed for outdoor environments where ordinary patch cables fail. They are double-shielded and PoE 802.3af compliant to 80 meters, allowing them to provide full PoE power over distance and making them an excellent alternative to rigid, stiff, standard PoE cables,“ said Dustin Guttadauro, Product Manager. These new 600V PoE industrial Ethernet cables are available in teal and black colors, and in 1, 3, 5, 10, 15, 25, 50, 75, 100, 150, 175, 200 and 250-foot lengths. Custom lengths and labels are also available upon request. L-com’s new Cat5e, high-flex, PoE, industrial Ethernet cables are in stock and available for immediate shipment.